By 1888 Francis Kimball had established a reputation as one of the most talented architects of his time. His work encompassed a variety of structures—mansions, churches and commercial buildings. But this year he would go a step further. He would design a skyscraper. At the northeast corner of Broadway and John Street sat the headquarters of the Corbin Banking Company. Austin Corbin, president not only of the bank, but of the New-York and New-England Railroad, commissioned Stephen D. Hatch to design a new building for the site. Something went wrong, apparently, and quickly Francis Hatch Kimball took over. The architect was faced with a potentially problematic building site. Only 20 feet wide on Broadway—the width of an average townhouse—the property stretched back 161 feet along John Street. 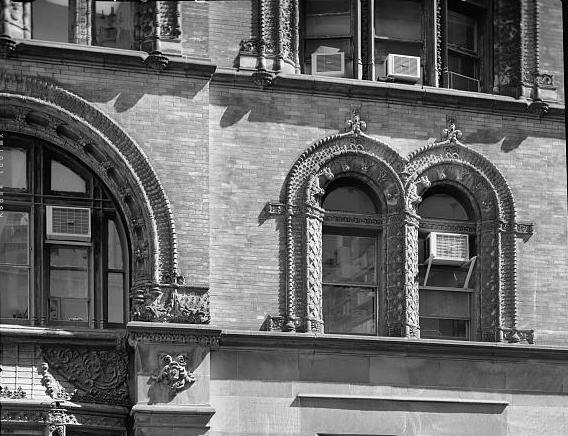 When completed the Corbin Building was striking in its proportions and exquisite detailing. In relation to its neighboring buildings, the Corbin Building soared. 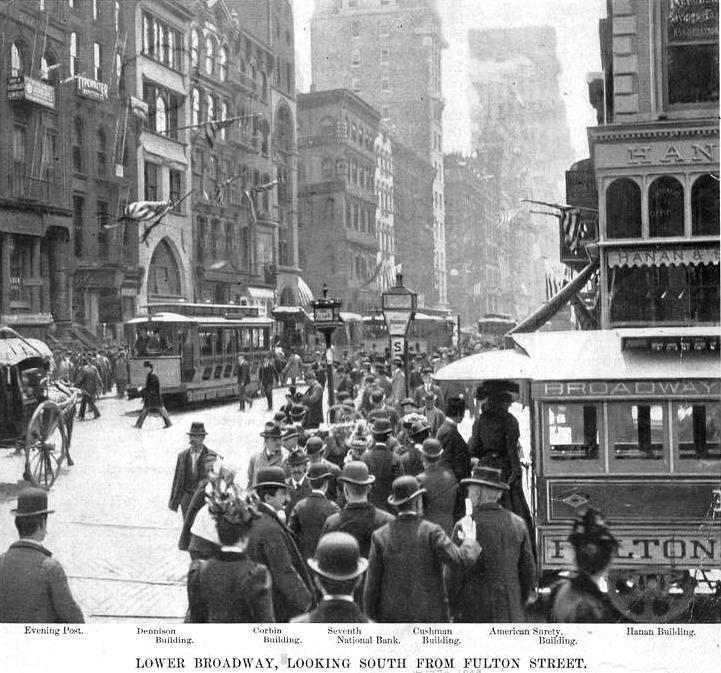 It rose a full eight stories above the pavement with a pavilion on the Broadway end; a pioneering skyscraper. Kimball made full use of his far-reaching experience with terra cotta as ornamentation. Nearly 400 terra cotta panels embellished the façade. He distinguished the upper five stories from the lower three by use of materials—buff brick and muddy terra cotta for the former and dark brownstone below. Rows of arches along John Street emphasized the verticality of the structure which ranked among the tallest in the city. That particular year was not a good one for Austin Corbin. In March 1892 he was “crowded out” from the directorate of the New-York and New-England Railroad in what The New York Times described as “a blaze of epistolary indignation.” Although his successor, named Parsons, removed the railroad’s headquarters to his own offices at 6 Wall Street, Corbin did not appear to accept his dismissal without an intended fight. Ewer worked in the mortgage department of the bank, handling much of the correspondence. On Saturday April 23 Assistant Treasurer George S. Edgell handed him $12,000 in cash received as payment on a note secured by a mortgage. A snag in processing the deposit meant that the payment would have to wait until Monday morning so Ewell returned the money to Edgell who secured the cash in a drawer in the safe. At noon on Monday, Ewell walked out of the bank for lunch and never came back. Austin Corbin’s troubles were exacerbated later in the afternoon it was discovered that the $12,000 was gone as well. In the meantime, the upper floors continued to attract a variety of tenants. Attorney Fabius M. Clarke had his office here in 1893. Wholesale watch dealer J. H. Noyes was also here and that year he began an effort to organize the New York watch jobbers with the intention to standardize the prices of American-made watches. Austin Corbin died in 1896 leaving an estate of $4.9 million. Immediately upon the release of the will Corbin’s daughter, Mrs. Anna Corbin Borrowe, began fighting the other family members over the settlement of the estate. Repeatedly the courts decided against Mrs. Borrowe, but she was undeterred. The years of legal battling between Mrs. Borrowe and the rest of the family decimated the estate. On December 21, 1903 The Times placed the total amount left at $289,821. The Corbin Banking Company was now headed by Corbin’s son Austin and his son-in-law George Edgell (whom we remember as having passed the $12,000 in cash to Ferdinand Ewer four years earlier). In August 1907 the Corbin Banking Company failed, to be replaced on the first floor by The Chatham National Bank of New York. The Chatham Bank was an independent, privately-owned bank. The Bankers Magazine, in 1911, said of it, “The Chatham National stands alone. Not being affiliated with any other institution, it has not the disadvantage of being the ‘unit of a series’ or a ‘link in a chain.’” The bank would remain in the Corbin Building for decades. In 1937 the building was owned by the Collegiate Reformed Dutch Church. In May of that year it leased the entire building to Herman A. Groen, a wholesale jeweler, for a term of 21 years with the privilege of renewal. 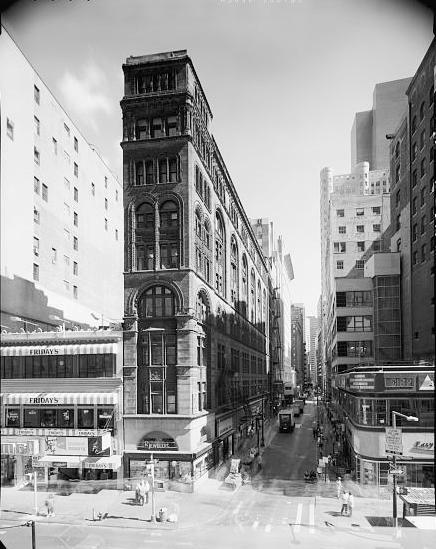 Groen announced his intentions to use part of the building for his wide-spread businesses, including the wholesale jewelry firm of H. A. Groen & Brother and the retail jewelry store of Walter & Co.
By the turn of the 21st century the adjoining buildings along Broadway had disappeared, causing the AIA Guide to New York City to call the Corbin Building “a slender book-end at the corner, with no books to hold up.” Preservationists were concerned when, in 2003, the Metropolitan Transportation Authority began plans for a $750 million transit hub to tie together a dozen subway lines. The site would be at the corner of Broadway and John Street. Indeed, the M.T.A. directed competing architects to consider the building rather than to assume it would be replaced. But in the end the demolition of the building was announced, setting off a highly publicized battle over the building’s fate—it was not protected by landmark status. 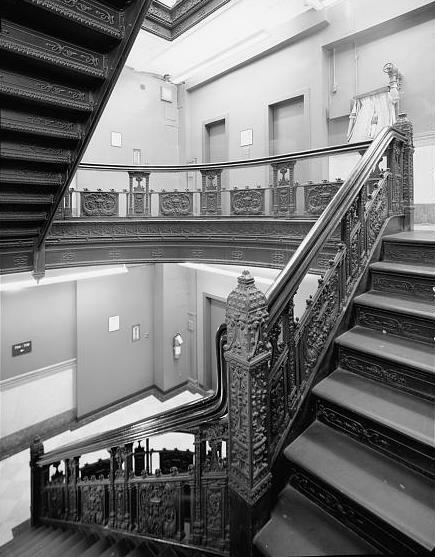 The Lower Manhattan Emergency Preservation Fund, composed of the World Monuments Fund, the National Trust for Historic Preservation, the Preservation League of New York State, the Municipal Art Society and the New York Landmarks Conservancy, took up the Corbin Building cause. Through the efforts of the Fund, the building was listed on the State and National Registers of Historic Places by 2004 and the MTA agreed to incorporate it into the transit hub. In 2012 the Corbin Building is sheathed in scaffolding and netting as the structure is restored and rehabilitated. The first floor will be restored to its 1917 appearance and original features such as the boiler will be visible to the passing subway passengers. Many thanks to reader Peter Alsen for requesting this post.